It has been well over 48 hours since I finished Code Name Verity but I feel as if I am still unable to form a coherent thought about it. Instead, my mind reads very much like this when the title of the novel is even mentioned: Beautiful. Poignant. Brilliant. Thoughtful. Bittersweet. Friendship. Love. Hope. Masterpiece. I think it is hard for me to pinpoint exactly what was so spectacular about this novel without giving too much away, but I do know that it completely surprised me and inspired emotions within me that I didn’t believe books could truly bring out (believe me, you'll need a handy box of tissues with you after the 50% mark). Code Name Verity is a true tear-jerker. It is a story about love, hope, and loyalty. It is a novel about friendship and sacrifice. It is a tale of courage, strength, and bravery. It is, in my opinion, truly inspirational and for me, its characters have taken on a life of their own, becoming my true heroes. It all starts with a confession: I AM A COWARD. Verity, a young Scottish girl who is a spy for the British Allied Forces is captured by the Gestapo when she strikes an unlikely deal with them. Verity will write out a full-fledged confession as long as the Gestapo guards do not torture her. Code Name Verity is Verity’s story of how she came to be captured by the Gestapo, but before that, it is a tale of true friendship. Verity’s tale is intertwined with the tale of her best friend and pilot, Maddie, who is found to be dead after delivering Verity safely to her destination. Now, Verity, filled with guilt and pain after her continued torture, has nothing left to lose. Thus, she tells the Gestapo everything – her memories of meeting Maddie, their blossoming friendship, their unlikely bonds of sisterhood, their journey in life, and their unfortunate parting. Verity brings absolutely nothing to this tale – nothing but the truth that is. Code Name Verity is a novel like no other. First and foremost, the writing was brilliant. I loved the manner in which Wein enabled us to meet her two dynamic heroines – Verity and Maddie. Through Verity’s novel-like writing of her time in the Gestapo and her slow confession, the reader is transported into the difficult times facing people during WWII and how the strongest of friendships can be forged in the unlikeliest of hours. It is impossible not to fall in love with the bond between Verity and Maddie and feel for Verity, despite her willingness to give up valuable information to the Gestapo. For all her blatant flaws, Verity is perfect in her own way and is written in such a manner that the reader cannot help but empathize with her torture, grief, pain, and horrible situation. In many ways, Code Name Verity could be just another historical fiction novel, but it isn’t. Not only is the idea that Wein writes about unique, the manner in which she executes it is as well. I won’t give anything away, but there are plenty of surprises throughout this novel. Unlikely and unexpected circumstances come to pass and I admired how I was unable to suspect them despite their obviousness. That, in my opinion, is a truly remarkable style of writing. However, what makes Code Name Verity so remarkable is Elizabeth Wein herself. It is evident that Wein loves pilots. Although the beginning of this novel is excruciatingly hard to get through (I’d say that the novel picks up at around 40%) and is bogged down by innumerable descriptions of multiple planes and flight techniques, it is somehow a marvel to read because of how much of herself Wein has poured into this story. Her love for pilots, her penchant for friendship and feminism, her adoration for this time period – all of it is deeply felt throughout the novel and that, more than anything else, makes this spectacular. Elizabeth Wein aside, I think the reason why I loved this book so much were the characters. Yes, the plot was scintillating and interesting. Yes, the writing was stellar and unexpected. Yet, it was Maddie and Julie (Verity’s real name) that made this novel the novel it was. For me, these two girls are heroes, not only because of their friendship, but because of the strength and courage they proved they had in a difficult time period. I loved how this story focused solely on their relationship and left aside any mentions of romance and if nothing else, this novel is a testament to the role women played during WWII and their spirit that still lives on in women today. In addition to Julie and Maddie, I found myself falling in love with the large cast of secondary characters as well. No matter how small a role they may have played, they contributed to this overall story and that in itself, makes them likeable. I think Elizabeth Wein mentioned this in her Author’s Note, but Maddie and Julie are not real. Their story didn’t actually happen, but it feels like it did. Even though these are two fictional characters, they will always carry a special place in my heart. Furthermore, they will never be forgotten – their sacrifices, courage, and friendship is sure to live on in the hearts of every reader and be carried with them, no matter how long they live. 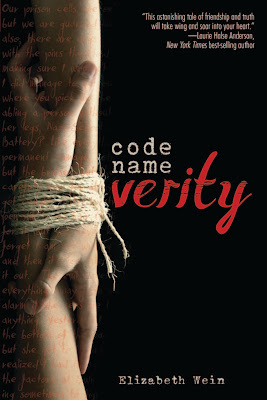 In my opinion, Code Name Verity is a novel that deserves to be read by everyone, no matter your gender. It is a rare gem in literature and one that will impact you in ways you never thought possible. Same as Rachel, I have heard many good things about this book. My hestitation is its historical notion. I tend to avoid historical novels. But I'll have to get over that, so I can delve into more books. Which does not help my TBR list at all. I definitely loved the characters & friendship in this one. Really beautiful! I've heard a lot of great things about Code Name Verity and I hope I can get a copy of this book soon! I'm glad that the book sounded like it actually happened:) Thanks for the review! Thanks for the review! I'd seen this one around but hadn't read any reviews, so I wasn't quite sure what to expect. I'm glad to see that it's a worthwhile read...it sounds intense! What an amazing review! I've heard really great things about this one. I got a copy from the library last week but I haven't started it yet. Now I know what I'm missing.